Eighty-six 470 teams competed in the annual All Japan 470 Championships hosted in Enoshima from 19-24 November. 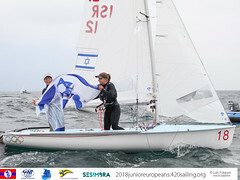 Over the five race days, 10 fleet races and a medal race were held with the 470 Men and 470 Women teams sailing in one fleet. 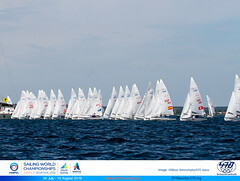 The fleet were split into gold and silver after two days and five qualifying races. No wind on day 3 kept teams ashore, and the Race Management team on catch up to organize four races on day 4. The final day of racing saw one race for gold and silver fleet with the top 10 advancing to the medal race which was held right in front of Enoshima Yacht Harbour. Undisputed winners were Kazuto Doi/Kimihiko Imamura who won 7 of the 10 fleet races and marched into the medal race carrying an 8 point advantage over Tetsuya Matsunaga and Yugo Yoshida. The positions of the top two teams stayed the same after the medal race with Shibuki Iizuka and Shinji Yayama finishing in third overall. Not surprising to see Ai Kondo and hew new crew Miho Yoshioka claim the top honours in the 470 Women fleet. 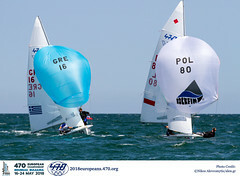 Tomoyo Yamaguchi and Eri Hatakeyama were the second placed women’s fleet.